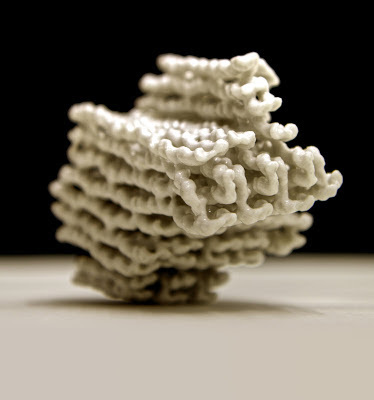 This 3-D print shows a DNA-based structure designed to test a critical assumption -- that such objects could be realized, as designed, with subnanometer precision. This object is a relatively large, three-dimensional DNA-based structure, asymmetrical to help determine the orientation, and incorporating distinctive design motifs. Subnanometer-resolution imaging with low-temperature electron microscopy enabled researchers to map the object -- which comprises more than 460,000 atoms -- with subnanometer-scale detail. A breakthrough in the understanding of DNA nanotechnology may lead to faster and more efficient ways to manipulate DNA into artificial structures and molecules. DNA nanotechnology is the science of manipulating nucleic acid like DNA and RNA to form artificial structures. DNA is responsible for storing, transmitting, and encoding genetic information. With DNA nanotechnology, it is used for bio-engineered applications. DNA is known for its structure; the double helix. The structure is based on the binding of two base pairs of nucleic acid. Because the principle of the pairing of these strands, scientists can manipulate these pairings to form other more complex structures. There are two studies in DNA nanotechnology; structural and dynamic. Structural DNA deals in building complex molecular structures which can be used as a base for more complex structures or as a shell for other components. In dynamic dna, the principle is to build an artificial molecular strand or structure that can interact with other strands to achieve a predetermined outcome either structurally or chemically. There are two ways to manipulate DNA, through molecular modelling or nucleic acid thermodynamics. Molecular modelling is based on understanding the behavior of these components at a molecular and even atomic level. By manipulating the interactions of these acids, the strands can be directed to form patterns or structures. In nucleic acid thermodynamics, temperature (heat) is used to stimulate these strands to behave in a certain way. DNA nanotechnology has various applications. It can help understand the principles behind biological structures which in turn can lead to the development of specialized components with unique properties. A theoretical example would be an enzyme that can break down oil or petroleum in an oil spill. This technology can also help in producing biological "containers" used in drug delivery for certain types of diseases and conditions. The principle behind this is that the structure would release its drug payload when it interacts with a specific cell like a tumor or obstruction (plaque in blood vessels). Two major barriers to the advancement of DNA nanotechnology beyond the research lab have been knocked down. This emerging technology employs DNA as a programmable building material for self-assembled, nanometer-scale structures. Many practical applications have been envisioned, and researchers recently demonstrated a synthetic membrane channel made from DNA. Until now, however, design processes were hobbled by a lack of structural feedback. Assembly was slow and often of poor quality. Now researchers led by Prof. Hendrik Dietz of the Technische Universitaet Muenchen (TUM) have removed these obstacles. One barrier holding the field back was an unproven assumption. Researchers were able to design a wide variety of discrete objects and specify exactly how DNA strands should zip together and fold into the desired shapes. They could show that the resulting nanostructures closely matched the designs. Still lacking, though, was the validation of the assumed subnanometer-scale precise positional control. This has been confirmed for the first time through analysis of a test object designed specifically for the purpose. A technical breakthrough based on advances in fundamental understanding, this demonstration has provided a crucial reality check for DNA nanotechnology. In a separate set of experiments, the researchers discovered that the time it takes to make a batch of complex DNA-based objects can be cut from a week to a matter of minutes, and that the yield can be nearly 100%. They showed for the first time that at a constant temperature, hundreds of DNA strands can fold cooperatively to form an object — correctly, as designed — within minutes. Surprisingly, they say, the process is similar to protein folding, despite significant chemical and structural differences. "Seeing this combination of rapid folding and high yield," Dietz says, "we have a stronger sense than ever that DNA nanotechnology could lead to a new kind of manufacturing, with a commercial, even industrial future." And there are immediate benefits, he adds: "Now we don't have to wait a week for feedback on an experimental design, and multi-step assembly processes have suddenly become so much more practical." To test the assumption that discrete DNA objects could be assembled as designed with subnanometer precision, TUM biophysicists collaborated with scientists at the MRC Laboratory of Molecular Biology in Cambridge, UK. They produced a relatively large, three-dimensional DNA-based structure, asymmetrical to help determine the orientation, and incorporating distinctive design motifs. Subnanometer-resolution imaging with low-temperature electron microscopy enabled the researchers to map the object — which comprises more than 460,000 atoms — with subnanometer-scale detail. Because the object incorporates, in effect, a whole library of different design elements, it will also serve as a resource for further study. The results, reported in Proceedings of the National Academy of Sciences, not only demonstrate atomically precise assembly, but also show that such structures, formerly thought to be jelly-like and flexible, are rigid enough to be probed by electron microscopy. In contrast, DNA objects with 19 different designs – including plate-like, gear-like, and brick-like shapes – were used for a second series of experiments at TUM, reported in the latest issue of Science. Here the researchers' main focus was on the dynamics of DNA folding and unfolding. The usual self-assembly process is often described as a "one-pot reaction": Strands of DNA that will serve as the template, instructions, and building material for a designed object are placed together at a relatively high temperature where they will remain separate; the temperature is gradually lowered, and somewhere along the line the DNA strands zip together to form the desired structures. Observing this process in unprecedented detail, the TUM researchers discovered that all of the action takes place within a specific and relatively narrow temperature range, which differs depending on the design of the object. One practical implication is that, once the optimal temperature for a given design has been determined, DNA self-assembly – nanomanufacturing, in essence – could be accomplished through fast processes at constant temperatures. Following up on this lead, the researchers found that they could "mass-produce" objects made from hundreds of DNA strands within minutes instead of days, with almost no defective objects or by-products in the resulting batch. "Besides telling us that complex DNA objects are manufacturable," Dietz says, "these results suggest something we hardly dared to imagine before – that it might be possible to assemble DNA nanodevices in a cell culture or even within a living cell." From the viewpoint of fundamental biology, the most intriguing result of these experiments may be the discovery that DNA folding resembles protein folding more closely than anticipated. Chemically and structurally, the two families of biomolecules are quite different. But the researchers observed clearly defined "cooperative" steps in the folding of complex DNA objects, no different in principle from mechanisms at work in protein folding. They speculate that further experiments with self-assembly of designed DNA objects could help to unravel the mysteries of protein folding, which is more complex and less accessible to direct study.